A meadow by definition is sort of a landscape of low growing plants that provide a wide field of vision, in other words the plants are generally shorter than 2’ (+/-). Other characteristics seem to be that there are large irregular groupings of fewer plants in the landscape that appear to repeat, sort of how nature works (sometimes hard for people to replicate). Often there are lots of grasses and they tend to be in natural drainage areas – so frequently damp areas but “not always”. The grasslands with poppies blooming in many areas of southern California would be an example of a dry meadow. An unfortunate characteristic of the dry meadows is that they look beautiful from mid-winter and into spring. As we exit the seasonal rainy season they tend to look somewhat unattractive, this being a subjective judgment on my part. In any case lets take a look at some of our local meadows. First, we’ll look at a few meadow areas that are within an easy drive. Next we’ll take a look at a few meadow landscapes- created by humans. Both pictures are from “Happy Camp” a hiking area near the nursery. The top picture is what people might expect to see in a meadow in the region, annual grasses and California poppies. The bottom picture is also a meadow scene from the same area and consists almost exclusively of coast sunflower or Encelia california. In all these examples the meadows tend to have only a very few different species, not quite a mono-culture but close. Meadows are in drainage areas, and the plantes are pretty much the same size, 2’ or less. I didn’t focus on the wild things that feed from the meadow flowers but there here- all sorts of butterflies, hummingbirds, and bees. Note too that this is all in late winter through spring- the flowering season. When you pass through the flowering season into summer or fall in our warmer regions, things can get pretty harsh as you can see in the picture. In just a month or so out of the rainy season the hillsides have turned brown – sorry that’s “golden”. No more green grasses and the California poppies are going to seed. In fact it now looks like something my HOA would be writing me letters about. Let’s take a look at some meadows that were designed for a home or bigger area but designed by people not nature. One of the advantages of the meadows designed by a person vs. nature is that you can select plants for your meadow so that it doesn’t go through a totally dried out look in the “off season”. An HOA requirement. This is from a home garden. The central grassy areas stay green pretty much all year with a bit of irrigations – Carex preagracilis. In the middle, the orange, are California poppies that flower for a couple of months then go to seed for next years bloom. In the back are Verbena lilacina – the purple that, again with some irrigation will flower all year. These are also excellent for both bees and butterflies. In the upper right are some of our mounding/spreading sages. This one looks like Salvia mellifera ‘Tera Seca’. I sort of prefer either Salvia ‘Bee’s Bliss’ or Salvia leucophylla ‘Pt. Sal’ – same size/structure but they don’t lose their leaves so much in summer. If you’ll note there are grouping of relatively few plants and look nice all year as the Carex, with irrigation stays green. While the orange poppies will fade the purple flowers from the Verbena will bloom all year- and are fragrant as well. This is an old picture of the meadow area at the Santa Barbara Botanic Garden. Note there are repeated groupings of what looks like fewer plants. The flowering poppies are in large groups and repeat so your eye is drawn all the way to the back. 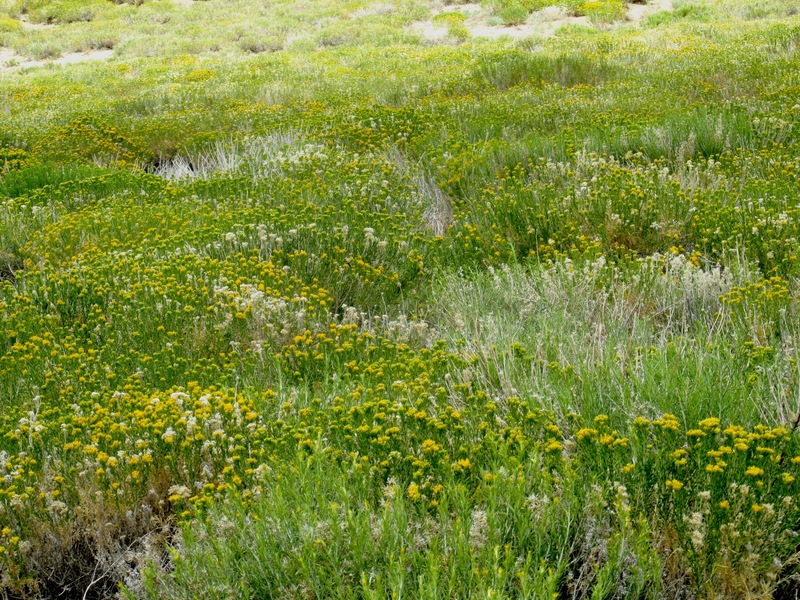 There are lots of other repeated plant groupings too like the green mounds of Baccharis in the middle. Hard to see from this picture but there are also some low ground mounding sages as well like Salvia leucophylla ‘Pt. Sal’. All of the native plants are fairly low giving a really long depth of field to take everything in. This is a home with a perennial meadow garden landscape. It also has large groupings of plants that repeat with your eye going to the middle making an “average” home garden seem bigger. The problem with this garden is that it reaches bloom peak in late winter through early summer then looks like hell. To deal with that in summer, everything needs a really big haircut. Some of the plants contained in the meadow area are chocolate daisies, California poppies, desert mallows, Salvia leucophylla and Salvia ‘Allen Chickering’ in the back. There are also matilija poppies in the back. Okay, now how does one go about all this? First, figure out where you want your new meadow garden. It can be a very large area or small, it’s up to you. Meadow gardens tend to use a lot of smaller and spreading plants so they can be expensive on a square foot basis. Second, clear the area of things you don’t like plants that not longer fit, rocks, and especially weeds. Third, now that the area is clear and you have a plan you can go buy your plants, bring them back to your garden and place them out according to your plan. Look at the plants you placed out from different angles and inside your house. Make whatever adjustments you need to make then it time to plant. Dig a hole for each plant such that the plant would sit even with the surrounding soil. Fill the hole up with water and let it drain out. Now, flip you plant in the pot upside down while supporting it with one hand and tap on the bottom of the pot and lift it off without breaking the roots. Ease it into the hole, cover around the sides and water in. Depending on the time of year and where you live you’ll be watering between 1x and 3x/week (summer) until established. Then once established, cut the watering frequency in half. Fourth, there is maintenance on these gardens. The more different plants you have the fewer grasses you have the more maintenance you’ll have. Still, you can cut things back that look ratty when you want. You can let grasses and Carex grow and cut them back or not depending on the look you want. The biggest maintenance will likely be weeds, especially the first year. To reduce weed problems mulch over the unplanted soil this not only reduces weed problems but it also keeps the ground cooler during the summer months. Still weeds will come up- best to pull or hoe them while they are small. Here are a very few suggestions for your new meadow garden. 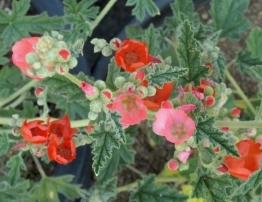 These are all plants that stay relatively small – under 2’. There also plants that over the years people have successfully used in this sort of landscaping application. Experience does count for something. And, if you do all this will you get more butterflies and hummingbirds? Yes. Achillea millefolium – yarrow both white and Island pink Yarrow – common meadow garden plant – native-either white or pink flower forms- with some irrigation flowers spring and again in fall. Carex pragracilis grass like, evergreen with weekly irrigation in summer. Eriogonum grande rubescens red flowering buchwheat from Channel Islands spring/summer and fall. Escholzia californica- California poppies. bright orange flowers late winter to middle spring. Festuca rubra or idahoensis Short clumping grass to 1-1/2′ evergreen. Monardella both odoratissima and villosa Mounding to 2′ lavender to purple flowers spring through fall- butterflies and bees. Penstemon hetrophylus BOP Low growing purple flowers spring to early summe sometimes fall- some irrigation. Salvia ‘Bee’s Bliss’ Low growing – spread with blue flowers spring and into summer. Salvia spathacea- hummingbird sage Shade to part sun- low growing – spreading with tall magenta flower spikes spring/fall. Zauschneria- cana or ‘Catalina’ -Calif. fuchsia Bright red flowers summer though fall -good hummingbird feeders.